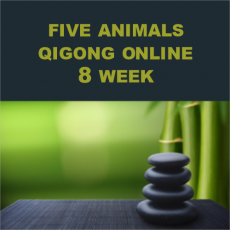 Five Animals Qigong is a fun, energetic series of movements that feel great to practice. This set was devised nearly 2,000 years ago by Hua T'o, the father of Chinese medicine. Movements of the crane, bear, monkey, deer and tiger strengthen the internal organs and harmonize the five elemental energies (fire, water, earth, wood, metal). Five Elements Organ Meditation will also be practiced. No experience needed! Tuesdays 11:30 am - 12:30 pm, starting Nov. 27, 2018. Note: no class Dec. 25, 2018 and Jan. 1, 2019.